Hana Pike is celebrating her Bat Mitzvah - the "religious coming of age" for Jewish girls. But she is not marking the event at her local synagogue in Nottingham. Instead she has travelled to the small town of Slavkov, in the Czech Republic. She is paying tribute to the Jewish girl she was named after, a six-year-old named Hana Rado. 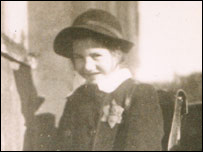 Hana Rado never celebrated her 13th birthday - she was killed at the Auschwitz death camp, a victim of the Nazi Holocaust. Almost every Jew in Slavkov died in the Holocaust, leaving behind only a crumbling synagogue and disused school. But a series of coincidences involving a sacred scroll led to an unlikely link between Slavkov and Nottingham. During World War II, the Nazis plundered more than 1,500 Torah scrolls from synagogues across the Czech Republic. Years later they were recovered and distributed to Jewish communities across the world for safe keeping. A scroll from the synagogue in Slavkov (formerly known as Austerlitz), ended up at the Nottingham Progressive Synagogue. Hana's father, Neil, was among a number of Jews in Nottingham who took an interest in the scroll's origin. He said: "We decided we'd do some research and find out if there was a Jewish community still living there. "We found that unfortunately all but just a handful had perished in the Holocaust. "So we set out on a task to make sure the memory of that community is preserved." It started with a memorial to the Holocaust victims in Slavkov's Jewish cemetery, which was installed by the Jewish community of Nottingham. Since then, Czech authorities have taken an interest and renovated the town's ageing synagogue. And most recently the old Jewish school was converted into a museum to Slavkov's Jewish history. Hana Pike's Bat Mitzvah was held on the same day as the museum's opening. It ended a day of events dedicated to the Slavkov Jews, which also included a play about the Slavkov-Nottingham link performed by students from the local school. Mr Pike said: "Some boys or girls can go to Israel to have their Bar or Bat Mitzvah at the Wailing Wall, but to have it in a little town in the middle of the Czech Republic, well that's something quite different. "This is actually, to the day, the first ceremony of this sort to be held in the town for 69 years... that is really something historic for the town, as well as for Hana." "I think of those deprived of celebrating their Bat Mitzvah"
"A young girl is making sure the traditions live on"